My recent hard disk failure made me realize that I had no idea where to find the CHDSK logs that are created when Windows runs CHKDSK at boot. In my case, I had just installed a drive that had a bunch of NTFS corruptions caused by a different computer. Below I walk though what I think is the easiest way to find the CHKDSK logs (and more) which are available in the Windows Event Log. Note: if you want to limit the search to just the recent events, you can add the starttime="11/25/2009" to the FilterHashTable parameter above. 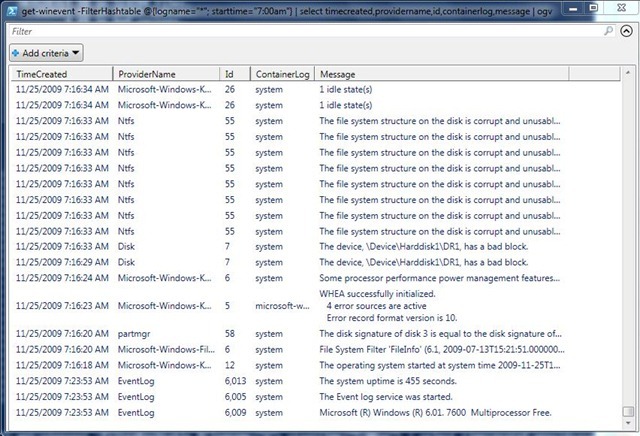 Windows stores the results of CHKDSK, among other things, in the Windows Event Log. This is a good thing because the Event Log does a great job managing a lot of data. Given that so many different parts of the OS are involved in writing to the disk, it wouldn’t make sense to write the results in several different text files. You’d never be able to find out anything. The only downside to this is that you have to learn to use the Event Log, which isn’t that hard. But how did you know where to find that!? Truthfully, I really didn’t. I had to dig. 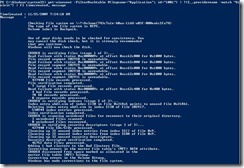 This is one of the reasons I use PowerShell. Sometimes I have to ask for everything and filter through to find what I want. In this case, I started with looking at absolutely everything that had happened since 7:00am today, which was the time of my last boot. I dumped this all to Out-GridView so I could see it easily. Next, I used Out-GridView to filter the results looking for the keyword “CHKDSK” in the Message field. This showed me who logged the event (Microsoft-Windows-Wininit) and what ID the event has (1001). From there, I created the query that is in the “Short” answer above. What about other related events? You can also see the same data in the Windows EventViewer, but I find it much harder to find things in there unless you know exactly what you’re looking for. 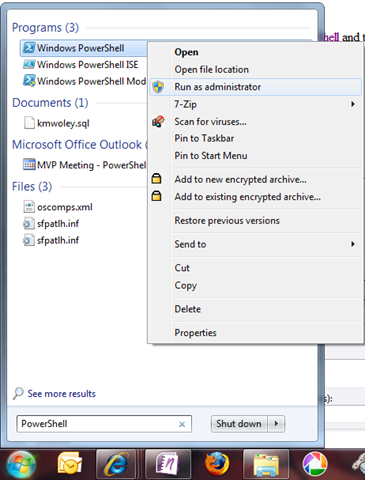 The Event Viewer can be found on Vista and Windows 7 by going to Start and then searching for “Event Viewer”. This was a very helpful post for me, thank you! In the date part, if you use a different system of date (e.g. : DD/MM/YYYY) you have to put in the command line to show the correct date interval. This has been very helpful indeed. thanks! The term 'logname=application' is not recognized as the name of a cmdlet, function, script file, or operable program." I did put it in quotes as suggested. If you cut and pasted the commandl ine into PowerShell, it's possible that there was a problematic line break inserted somewhere. Try typing out the full command without cutting and pasting and see if that works. EventViewer seemed easier. Yes, finding what you want can be tough. It helped knowing that I had to look for wininit and id 1001. I found that from last night's chkdsk run, went to the details tab, and could read my results. Thanks! 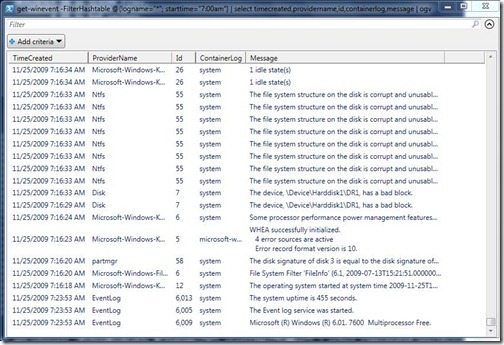 For Windows 7 the Chkdsk log can be found in the event viewer, applications, under "wininit". true – but looking through all the log entries can be a pain. This blog post has been very helpful, Thxs for the time-saver tips! JFYI, if the chkdsk log is too long, it gets truncated. Bad luck two times in a row (the first time was when your disk crashed and made chkdsk to be very verbose). When you said your ntfs drive was corrupted by another computer, that rang a bell for me. My 8 mo. old external hard drive suddenly had a ton of problems right after I started switching it between my Vista computer and Win7 laptop. Is that a no no? Open Windows Explorer->Root Partition-> Folder "System Volume Information"->Right Click,Properties and add your User Account with read permissions->open "System Volume Information" an go to the subfolder "Chkdsk". There are all CHKDSK Logs. My log file wasn't showing in event viewer, but it was right there. So much for log files being all on one master location. Phew. It is a lot easier just to go in Event Viewer, Find and type chkdsk, bang! 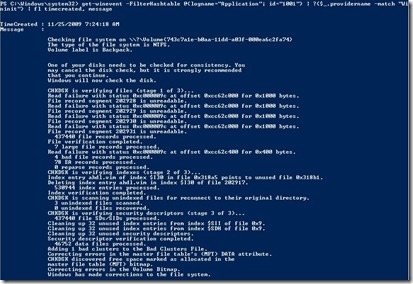 Every time after you scandisk or chkdsk in Windows boot up, it will store the log file to your windows. But where is it ? I don't know why the event viewer can't show all of the log file. Where does that setting get changed? My last chkdsk /r log file found in the System Volume InformationChkdsk directory was 56K and only the first 16k was logged in the event viewer. Not a very good thing to truncate it. Why oh why Microsoft!!!! 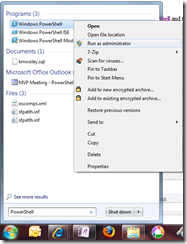 What to do when no "wininit" key is found and the powershell example above fails?? 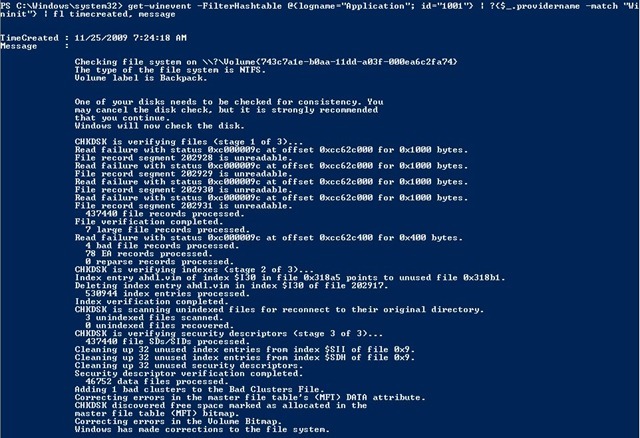 Pingback: PC/Computer gives a Blue Screen of Death (BSOD, tracked down to the hard disk drive by using chkdsk, which said that the C: drive was in the RAW format and the disk could not be checked | PC Buyer Beware!